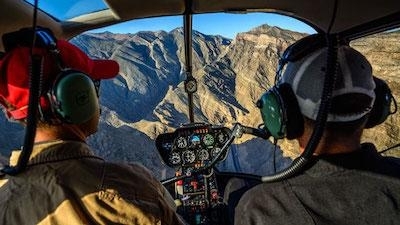 Sundance Helicopters and the Sundance Skypath program in Las Vegas is partnering with Southern Utah University Aviation to bring a pathway program that will be instrumental in providing graduating pilots with a clear pathway from school to industry. SUU is the third school to become a partner in the SkyPath program and joins other top-flight schools, Leading Edge Aviation (Bend, OR) and UND Aerospace (Grand Forks, ND), in offering the helicopter pilot development program. Pilot candidates involved in the SkyPath program will receive job mentoring, additional operating experience through internships and job shadowing, and guaranteed interviews with Sundance Helicopters after minimum program requirements are met. Because of the booming helicopter industry and the many graduates, SUU Aviation has each year, this new pathway program opens up many opportunities for both organizations by supplying the starving helicopter industry with much needed pilots. Current projections show the helicopter industry to be on the cusp of huge pilot shortages. Helicopters Association International has identified the gap between graduating students and top industry jobs to be one of the largest attributing factors to these shortages. Pathway program partnerships are critical to helping both the student pilot and the industry in placing experienced pilots where they are needed most. SUU Aviation’s graduates will now have a clear pathway after school and Sundance Helicopters will be hiring some of the best, most experienced graduates out there. Both organizations are fully dedicated to making this partnership a success for both SUU graduates and the Sundance Helicopter’s Las Vegas and Grand Canyon touring company.